What is Brand in the Hand? Brand in the Hand was launched by HACO in 1999 as a vehicle to offer third party advertising on packaged snacks. 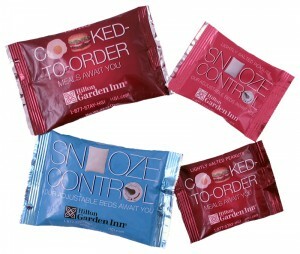 Each snack is referred to as an impression. HACO, in partnership with The King Nut Company, supplies packaged nuts, pretzels, mixes, dried fruit, etc. and provides an opportunity to advertise on the exterior package to hundreds of millions of airline passengers annually. Managed by HACO, Oakfield Farms Solutions (OFS) is the industry leader in fully assembled shelf-stable snacks and meals for airlines and offers potential advertisers an opportunity to promote both products and services via the exterior packaging, interior packaging and inserts. Onboard promotions are a unique hybrid of sales and marketing and supply chain management – we excel at both! Allows access for advertisers to a captured High Household Income audience. Unlike other media options, branded messages on snacks and other items distributed onboard are hand-delivered impressions that can’t be ignored! Allows the airline to receive revenue to help offset the cost of products that they are already purchasing.